Spiritual travel and the experience of leaving the body may provide a kind of dress rehearsal for physical death. The spiritual traveler realizes by immediate personal experience that the everyday world that is normally so stable and predictable can disappear at a moment's notice, just as it will at the time of physical death. At this point, an entirely new world opens up to replace it. In some travel experiences, the traveler has the feeling of traveling huge distances from his or her earthly home and normal state of waking awareness in just a few seconds. The feeling that you are leaving the comfortable and familiar world of five senses behind is very strong in some spiritual travel experiences. Do you wish to play it safe and stop the experience because it may challenge the ego and its limited view of the world, and by doing so stay ignorant of some facet of reality, or are you willing to take the chance and perhaps learn something new? The intuitive feeling that spiritual travel may involve travel through the realms of the afterlife gives it a certain gravity, since it means one may be experimenting with life and death. Mystical experience is often said to transcend all dualities including the opposition of life and death. Shamans are believed by their cultures to enter the realm of the ancestors and converse with the spirits of the dead during ecstatic journeys out of the body. One great gift that spiritual travel may provide is a feeling of confidence that death is not the end, and a familiarity with the realms beyond the physical world. To experiment and gain knowledge of spiritual travel may provide a sense of familiarity with the other worlds so that death will be less of a shock. Those who have had near-death experiences almost always confirm this sense of increased confidence about their ability to handle the act of dying, and their belief in the existence of life after death. Death can be a new birth into a confusing and alien world where like an infant, the soul is dependent and incapable of choosing its destiny. Or it can be a kind of graduation where after a long period of schooling, the soul enters a new world with a confidence that comes from having learned what it needs to know to survive, to thrive, and continue its evolution. 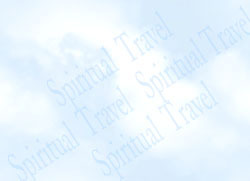 Spiritual travel is schooling for the soul as it approaches the death of the physical body. Death is like traveling on an airplane for someone who has never ridden one before, and is unfamiliar with modern technology. The noise is frightening, the passenger is cramped and uncomfortable, once in the air he or she is a long way from earth and what is familiar, the air on the plane is different, and there are warnings of possible dangerous situations. It can be frightening. But riding planes often (as in practicing spiritual travel) lessons the fear. Death is one of life's greatest challenges. But death is like war, childbirth or any challenging experience. To use the war example, the inexperienced soldier never knows how he will react under fire. The best he can do is train and learn everything he can to help him face the battlefield situation with confidence. If his training is good, he will likely return from battle with life and limb intact. You are going to death's door bound hand and foot! The knowledge of spiritual travel can serve as a set of wings for the soul as it enters the vast open sky of the afterlife at the time of physical death.